After waiting years for the sun to illuminate Saturn's north pole again, cameras aboard NASA's Cassini spacecraft have captured the most detailed images yet of the intriguing hexagon shape crowning the planet. The new images of the hexagon, whose shape is the path of a jet stream flowing around the north pole, reveal concentric circles, curlicues, walls and streamers not seen in previous images. Images and the three-frame animation are available at http://ciclops.org, http//saturn.jpl.nasa.gov and http://www.nasa.gov/cassini. The visible-light cameras of Cassini's imaging science subsystem, which have higher resolution than the infrared instruments and the Voyager cameras, got their long-awaited glimpse of the hexagon in January, as the planet approached equinox. Imaging team scientists calibrated and stitched together 55 images to create a mosaic and three-frame movie. The mosaics do not show the region directly around the north pole because it had not yet fully emerged from winter night at that time. Scientists are still trying to figure out what causes the hexagon, where it gets and expels its energy and how it has stayed so organized for so long. 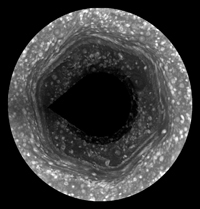 They plan to search the new images for clues, taking an especially close look at the newly identified waves that radiate from the corners of the hexagon -- where the jet takes its hardest turns -- and the multi-walled structure that extends to the top of Saturn's cloud layer in each of the hexagon's six sides. Scientists are also particularly intrigued by a large dark spot that appeared in a different position in a previous infrared image from Cassini. In the latest images, the spot appears in the 2 o'clock position. Because Saturn does not have land masses or oceans on its surface to complicate weather the way Earth does, its conditions should give scientists a more elementary model to study the physics of circulation patterns and atmosphere, said Kevin Baines, an atmospheric scientist at NASA's Jet Propulsion Laboratory, Pasadena, Calif., who has studied the hexagon with Cassini's visual and infrared mapping spectrometer. "Now that we can see undulations and circular features instead of blobs in the hexagon, we can start trying to solve some of the unanswered questions about one of the most bizarre things we've ever seen in the solar system," Baines said. "Solving these unanswered questions about the hexagon will help us answer basic questions about weather that we're still asking about our own planet."